Robert Taylor (far right), the first African American on the CHA board, envisioned racially integrated public housing throughout the city. The name Robert Taylor has long been associated with Chicago public housing. But, before the notorious housing complex opened, Robert Taylor, the man, was known otherwise. Those were lessons he taught Bowman, 76, and her 78-year-old sister Lauranita Dugas—both respected educators—while growing up. They lived comfortably, but he also exposed them to the shoddy housing in their Black Belt neighborhood. Taylor served on the CHA board from 1943 to 1950. Housing interested him early on. Taylor, who was born in Cleveland, Ohio, in 1899 and moved to Tuskegee, Ala., soon thereafter, was the eldest of four siblings. He learned to build houses from his father, a Massachusetts Institute of Technology graduate. The younger Taylor came to Illinois in 1924 and graduated from the University of Illinois at Urbana-Champaign with a degree in banking and finance. He ventured to Chicago to work at Binga Bank, the first black-owned and operated bank in the nation. Later, he managed the famed Rosenwald building at 47th Street and Michigan Avenue. He also worked in savings and loans as a way to give blacks loans for housing. Taylor also built houses in south suburban Harvey and Robbins. In his personal life, the bespectacled Taylor was an upright man—traditional, he never cursed and was always detailed. His wife, Dorothy, was as easy as he was stiff, the daughters said. Having daughters pleased him, and he liked to talk to young people, taking their friends to dinner. When Mayor Edward J. Kelly appointed Taylor to the CHA board, his family was excited and knew it was an important position. “He thought he was going to make a difference,” Dugas said. Taylor had traveled throughout Europe to study public housing. He envisioned units in Chicago with open space, grass and gardens, and he wanted the units to be dotted across the city. But the city’s political climate stymied him. “I think he felt he pretty much had the cooperation of the rest of the commission, but they were being held captive by the aldermen. They didn’t want [integrated] public housing in their wards,” Dugas said. 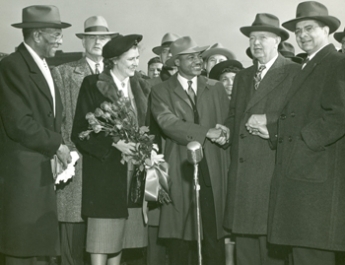 In 1950, Taylor resigned from CHA board. “He agonized over it. They were going to gerrymander all the blacks in segregated housing,” Bowman said. Her father died of a heart attack in 1957. As a tribute to Taylor, some commissioners pushed to have the new CHA high-rises in the early 1960s named after him. The family had mixed emotions: They knew he opposed public housing high-rises, but they also longed for Taylor to be recognized. Today, the daughters are happy that the apartments are being razed. For years, Dugas averted her eyes from the Dan Ryan Expressway, the Robert Taylor Homes a constant mockery of what her father stood for. She said the picture of what once ran for miles along the South Side would’ve broken his heart. “If the new [mixed-income communities] would have room for all kinds of people, he’d be supportive,” Bowman said.